My Dog Is Scared Of Fireworks What Can I Do? Time to get proactive for next years craziness on the Fourth of July. 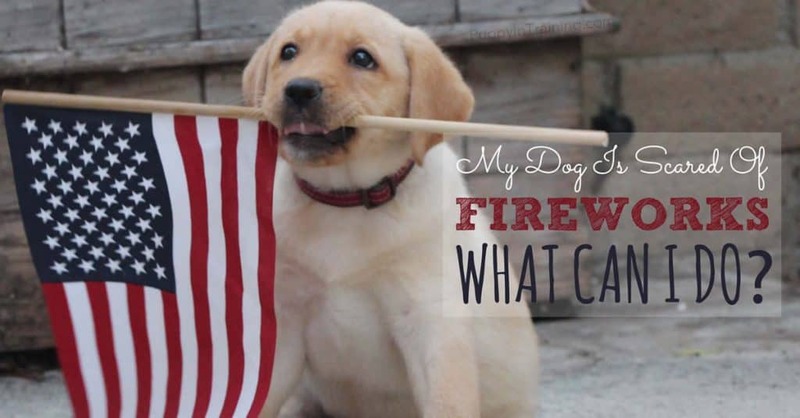 Does your dog have firework anxiety? Are you asking the question: My dog is scared of fireworks what can I do? Our dogs get anxiety from fireworks too. Here are a few things we do during firework season. For many years we lived in Irvine, California where the city is very strict on their firework policy. In general there are very few loud bangs of an M80, whistles of a Piccolo Pete, or screams of a bottle rocket. We already knew Linus had some noise anxiety, but fortunately in our quiet Irvine abode we had very few problems with loud noises even during the fourth of July. That all changed when we moved to a new city. Firework activity in our neighborhood began ramping up a week before Independence Day. Linus and Raven already began showing firework anxiety. In response we began making preparation for a noise filled fourth of July. If you’re dog gets lost how will you find him? Make sure you have your dog’s collar on nice and snug. While tags and microchips are always important in case your dog is ever lost it’s uber important during the fourth of July. There are also GPS tracking devices for dogs. Unfortunately, we have yet to test any of the GPS systems it may be worth the investment to get your best buddy home safe and sound. This fourth of July and the days leading up to firework frenzy day we stayed home with our dogs during the evening hours. Staying home helps ease our dog’s anxiety and also allows us to keep an eye on any unusual behavior. Unfortunately for my brother his dog had such severe anxiety he tore off his dew claws trying to scratch through and escape the noise. We walked Linus, Kona, and Raven for about an hour before the fireworks began hoping to wear them down before the madness struck. A tired dog is usually a better behaved dog. We bought Linus a Thundershirt many moons ago and we’ve had mild success. It seems to ease his anxiety ever so slightly, but as anyone who can attend to a dog with anxiety, every little bit helps. This year we also bought a Thundershirt for Raven with the hope that it would ease her anxious behavior. 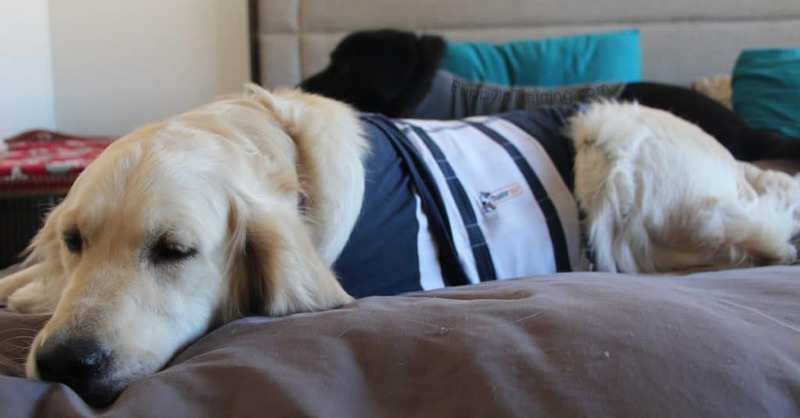 Check out the blog post on ThatMutt.com: Does the Thundershirt Stop Separation Anxiety? Honestly, I think this is our biggest saving grace when it comes to the firework season. While the boom of an exploding mortar round can shake the house we can drown 90% of all sounds by cranking up the volume on the television, turning on our indoor A/C unit, and cranking our fans to high. At our house our dog’s safe place is their crates. Throughout a regular day we often find Linus and Raven sleeping in their crates. During firework season the importance of a crate is magnified. When loud noises strike Linus finds more comfort in a dark closet then his crate so I will leave closet doors cracked so he can find his safe place. We don’t medicate our dogs, but my brother’s dog Georgie has severe anxiety and has been prescribed several different meds for his noise anxiety. We have a list of blog posts below that discuss some different types of medications that may help your dog, but remember to always consult your vet before administering any type of medication to your dog. The combination of fostering, pet sitting, and raising a service dog puppy we totaled 5 dogs in our household this past 4th of July. Two out of five dogs had noise anxiety from the excessive fireworks. The week leading up the the 4th, Linus confined himself to our master closet and had a couple accidents when we left during the evening. Linus never has accidents so this was definitely a case of firework anxiety. We decided it would be a good idea to follow tip #2 and stay home with our dogs during the firework extravaganza on the fourth of July so we rented a movie, grabbed some popcorn and piled everyone into the master bedroom. We cranked up the volume on the TV, set our AC unit on high, turned on the fans, and dressed our dogs in their thundershirts. While we could still hear fireworks banging and exploding outside our house our two anxious dogs, Linus and Raven both fell asleep cuddled up beside us on our King-sized bed. We had a successful somewhat dog anxiety free 4th of July. Benadryl For Dogs During Fireworks, Does It Work? – Lindsay from ThatMutt.com says: “Yes, if your dog is scared of fireworks or thunder it is OK to give a dose of Benadryl to help calm your dog’s nerves.” ***Always consult your vet before giving your dog any kind of medication. Make sure and click through to the above blog posts. 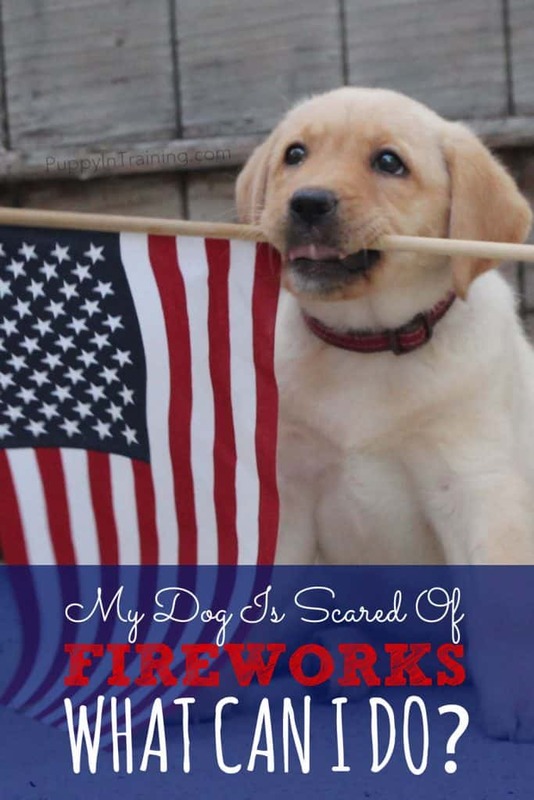 There are many great tips on how to help you dog if he is scared of fireworks. So what about you guys? Do you have a dog with noise anxiety? What do you do to help him through the night? How did you dog do on the Fourth of July. Tell us about your experiences in the comment section below. I had a terrible time with my Lab this year. We had exposure to a lot of fireworks. They started the Thursday night before the 4th & we still had a few very loud firecrackers set off by individuals nearby. Thursday night the local college had a long display which could be both seen & heard. They lasted about an hour. There was another public display (although I can’t remember which night). I was afraid to take her out at night for several days after the 4th. Jada (a 5-yr. old Lab) starts shaking & whining as soon as she hears anything. Her comfort place seems to be on my pillows behind me. I do have a natural calming remedy (it contains 3 ingredients that are supposed to promote calmness) but I was unable to try them. Maybe I’ll get her a Thunder Shirt for next year. I’m sorry to hear about Jada and her experience with fireworks this year. She sounds very similar to my Linus who finds comfort lying on the body pillows behind me on the bed. Linus and I were 10 minutes into our walk last night when he heard someone lighting fireworks off in the distance. He immediately turned around and headed home. I’ve hear varying levels of success with the Thundershirt and while it’s definitely not a miracle cure for Linus we thought enough of his Thundershirt to get a second one for Raven. If you end up getting one hopefully it helps Jada with her anxiety. Let us know if you come across any other remedies for firework anxiety in dogs. Great list of options, and I love all the resources at the end. (thanks for the shot out) I’m fortunately with my current dog that she isn’t bothered in the least by fireworks. Luckily for us staying home and making sure she has her safe place is good enough. It’s such a stressful time for animals, so making sure they’re microchipped is so important – just in case. No problem on the shout out. Our 4th of July blog post is about a week late, but hopefully it will help someone for next years festivities and for our family we get fireworks year round from Disneyland and Anaheim Stadium (luckily they’re far enough out that they don’t really bother any of our current dogs). Great ideas! I agree…something as simple as turning on the TV or the radio for the dogs can help a lot with their anxiety. I hope not too many people lost their pets on the fourth! Archer, Stetson, and Kona don’t seem to worry much at all by all the noise, but I could easily see Raven or Linus getting lost and scared if they weren’t able to stay in the comfort of their home. I guess I’ll be spending the fourth of July at home for the foreseeable future. Oh, this is a great resource. The fourth of July was really tough this year since our terrier freaked out at all the homemade fireworks in the neighborhood. I love the idea of trying to tire them out before the fireworks start- I wouldn’t have thought of that! Thanks! Hopefully it helps your terrier during next years fourth of July. Let us know if you find any other good ideas for dogs sensitive to fireworks. Thanks for stopping by! Usually I will just hug my dog and pat him on the head. It helps. I have never tried to use ‘white noise’ before. Fortunately, two of my dogs don’t mind fireworks and other loud noises, but for Raven and Linus the white noise really helps. Thanks for the fourth of july safety tips! We have a male GSD who is also quite scared of fireworks, so every 4th of July he gets a special kennel set up for him in the basement with some brand new toys and smelly treats to enjoy.. Additionally we have a thunder shirt that we put on him and white noise generator in the room with him and one outside the door. Where we live we are on a bluff so the neighbors’ fireworks in the valley below us explode pretty much level with our house, but with these precautions Charcoal comes out happy as a clam at the end of the night. I think we’ve turned a night that he hated into one of his favorite nights of the year! Hope these help! Good luck! That’s great! I’m glad your were able to turn such a terrible night for your dog into his favorite night of the year. Thanks for sharing your experience.